As we saw in our last article, more than half of new businesses don’t survive beyond five years. In late 2014 British commercial insurer RSA conducted research called Growing Pains, which examined the current shape of the economy and barriers to growth for SMEs. But it’s not just start up businesses that are being adversely affected. 63% of small business owners nationwide admit that it is difficult to grow their business and this figure rises to 80% in London and the South East. According to David Swigciski, SME trading director at RSA: “The recession has had an unsteadying effect on small and medium enterprises (SMEs) and we need to work hard to rebuild their confidence. In this article we look at some of the reasons why small businesses - of whatever age - can fail, and some positive ways to rebuild business confidence. 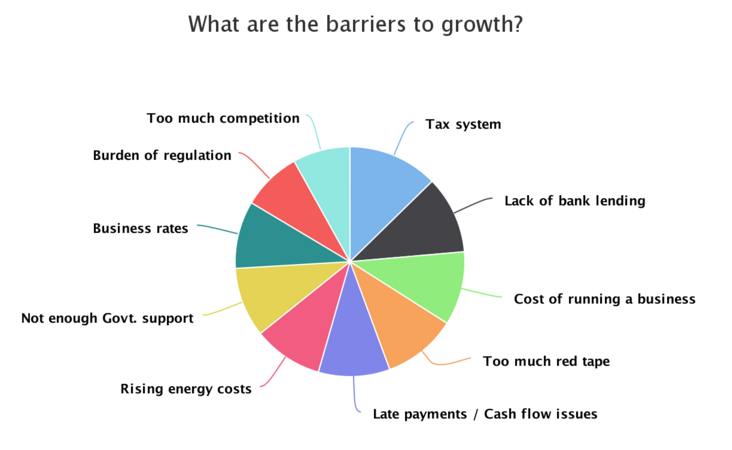 The image above shows some of the main barriers to growth as perceived by the small businesses surveyed by RSA. The UK tax system. 44% of SMEs cited this as their main concern. Lack of bank lending was the main concern of 38% of SMEs. Too much red tape came the top of the list for 36% of SMEs. Costs of running a business. Late payments or other cashflow issues. Since the research was published, there have been some positive developments that at least partially address the top two issues. As we recently reported in our Taxing Times blog, the UK tax system is being reformed to make things clearer and give both individuals and businesses the ability to manage taxes online. Bank lending should be more readily available with the extension of the Funding for Lending scheme, although many businesses still find flaws in the system and prefer to deal with small independent finance companies - such as Fair Business Loans - for small business loans and other types of small business funding. It is also worth being aware of the government-funded New Enterprise Allowance (NEA) which provides support to unemployed people who want to start their own business. The issue of red tape is still daunting for a small business owner. You need to become conversant with a variety of areas such as tax law, intellectual property law, employment regulations, digital regulations and insurance. But this need not be a deal breaker! There is lots of training available for these kind of areas, in the form of both training courses and online guides. Or how about clubbing together with a few other small business owners and each becoming expert in just one of these areas then helping the rest of the group to work their way through what you need to do? This approach could also be applied to the area of reducing business costs. If a few of you combine resources that is an excellent way of keeping costs down. Perhaps you could help a colleague with their accounts and they update your website. Or could you share premises / IT equipment / administrative staff? There are many ways to reduce costs and the main way to do it is to be open-minded and creative and see how you can work with others to achieve your common goals. Late payments and cashflow are both really difficult areas to lick into shape but this is not impossible. The key to success lies heavily in the area of planning and organisation. Customers may well pay late but you can keep this within firm boundaries by making sure your invoices and reminders go out promptly and that payment is chased up efficiently as soon as it becomes overdue. Wherever possible you need to set aside contingency monies so that financial commitments can be met even when payments are late. Easier said than done we know, but a large part of it is down to advance planning and organisation so that you are keeping on top of the finances and not letting things slide. Again, it could be worth joining forces with another small business to employ someone for a couple of hours a week just to chase payments and ensure that nothing is overlooked. Small businesses do fail but we believe that careful planning and collaborative working can overcome many of the pitfalls that await you out there! Watch this space for further business advice: we will do everything in our power to help you avoid becoming one of the small businesses that does not survive beyond five years!